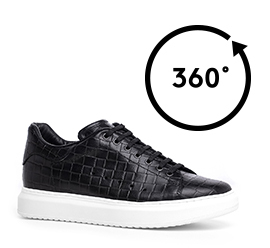 Luxury elevator sneakers with upper in black calfskin featuring an elegant checked pattern and sole made of natural rubber which provides maximium comfort. A versatile and dynamic sneaker ideal to wear with jeans, shorts or fabric trousers. The inner elevator system allows to increase height by 2.6 inches (6.5 cm) in total secrecy.